Sterling Faucet Company was founded in 1907 and prospered for many years as a leading independent manufacturer of faucets and other brassware. In 1984 Kohler Company acquired Sterling to provide a foundation on which to build a mid-priced, full-line plumbing brand. Sterling, a Kohler brand, and Sierra Remodeling pride themselves on providing reliable and affordable products that meet the real needs of real people. Their products can be installed quickly, can be cleaned with ease and offer proven performance day in, day out. And the sophisticated styling of Sterling products complements a wide range of decor – from warm and traditional to clean and contemporary. Now you can arrange your shower exactly the way you like it. STORE+™ is a fully customizable storage system with movable accessories that eliminate clutter. Cushioned, durable and easy to clean, the patent-pending ComforTrack is designed to change the way you feel about bath and shower doors. 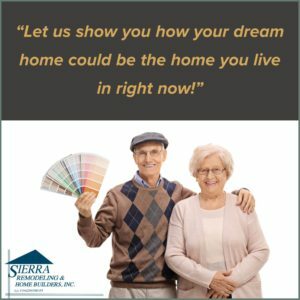 Here at Sierra Remodeling we have installed many comfortable and safe Sterling bathtubs and high quality shower doors. Immerse yourself in style and comfort with Lawson air massage baths, whirlpools and traditional drop-in baths. Sierra Remodeling and Lawson give you the options of enjoying the warm massage of thousands of bubbles, the deep hydro-massage of directed whirlpool jets or the pure calm of still water. Offering clean style and ergonomic design, we will install your Lawson product that features gently curved back and neck support, as well as armrests that offer added stability when you step in and out. Let Sierra Remodeling make your laundry room remodel seamless and even more functional with a versatile utility sink from Sterling. We can install your Latitude® utility sink as a freestanding, topmount or undermount sink, depending on the look and feel you want. We can give you master bath luxury without the hassle of a custom installation using the Lawson Oval drop-in bath from Sterling. With elegant looks and durability to match, it also features water savings and superior durability. Sierra Remodeling and Sterling offer you a tub-to-shower conversion. We offer the perfect bathroom remodeling solution with Sterling’s STORE+® end-drain shower. With plenty of interchangeable storage options and a stylish look, it easily fits right over your bath drain for your tub-to-shower conversion. To the Crew at Sierra Remodeling – especially Scott, Tom Sprague, Greg Larrison and Greg Miller – THANKS GUYS!! Talk about miracle workers! I never dreamed our master bath could have been converted from such a mess into a beautiful room!! The work you did was just outstanding, and surprising! I can only hope management realizes how talented and polite their staff is. In fact, the staff made the dreaded remodeling effort actually pleasurable as they were courteous, efficient & always ensured they cleaned up. I will highly recommend your services!! Thanks and Merry Christmas! ― Betty S. and Mike T.